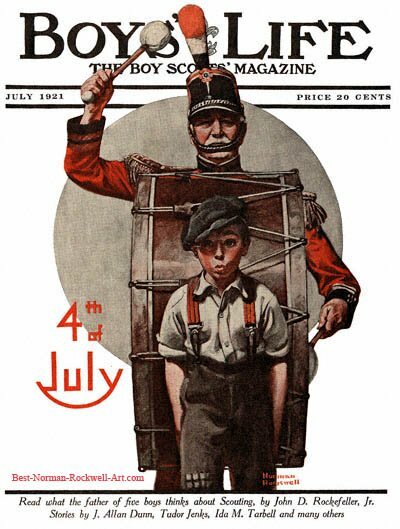 Fourth of July, this Norman Rockwell painting, appeared on the cover of Boys' Life published July 1921. An alternate title for this painting is Boy Whistling in Parade. This event marked Rockwell's fourteenth cover publication for Boys' Life. This was also the first cover painted specifically for Boys' Life by non-employee Norman Rockwell. Up until this cover, the cover illustrations were part of Rockwell's job as art editor or reprinted from Red Cross. Boy's Life readers had become familiar with artist Norman Rockwell through his article and story illustrations and also other cover illustrations. Rockwell had served as the art director of Boys' Life from 1913 to 1916. But by 1921, Rockwell was one of America's most in demand illustrators. In this painting, Rockwell raises our patriotic feelings. For those patriots who were unable to attend a 1921 July 4th parade, this illustration helped them to feel those same emotions. The elements of the painting are simple enough. The bass drummer is carrying and beating his big bass drum. He wears a red uniform jacket with gold epaulets on the shouders. His hat is somewhat crooked on his head. Perhaps he is beating so hard it is making his hat move. Or perhaps the hat is just where he prefers to wear it. Walking in front of the drum is a boy. The boy appears to be whistling. He is dressed in older clothes. Notice the patch on his right knee. The boy's cap is also worn at an angle like the drummer. It almost appears that the boy is helping to carry the drum. But why would the drummer need the boy's help? The last element besides the 4th of July logo is the circle in the background. This is a familiar element in Norman Rockwell paintings. This particular circle appears to represent a drum head, like in the bass drum from the parade. This style is typical of Rockwell's cover work of the period.